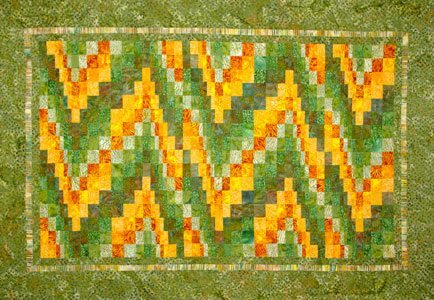 The Bargello in this quilt is designed from blocks. This is a great way to learn the technique, as these blocks can stand alone as candle mats, table toppers, 14″x18″ place mats or join several to make a table runner. Different arrangements are included in the pattern, but you are encouraged to experiment. You could even make the large quilt by sewing the blocks together. To purchase through Pay Pal, click on one of the buttons below. Price includes shipping/handling in the USA, Territories and Possessions. International postage is extra and handled through Pay Pal.